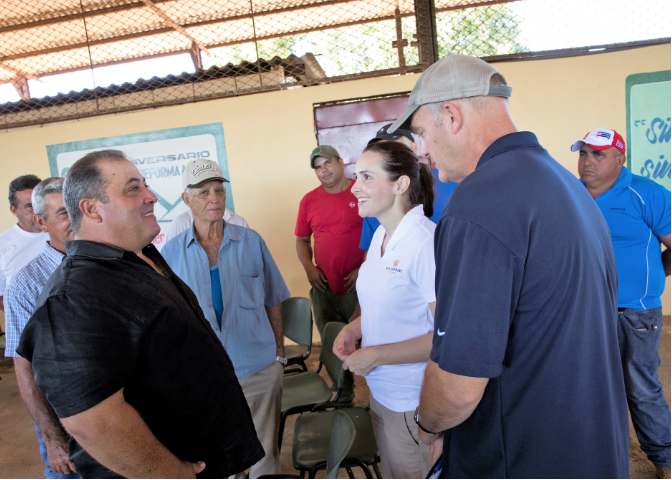 Catalina Correa, U.S. Grains Council regional marketing specialist, meets with Cuban farmers while in the country for the Cuba and U.S. Agriculture Business Conference. Huge potential remains for U.S. agricultural exports to Cuba, including corn, sorghum, barley and their co-products, but so do steep trade challenges, U.S. Grains Council staff learned on a recent industry mission to the country. Council staff from the Western Hemisphere office participated this month in the Cuba and U.S. Agriculture Business Conference in Havana to learn more about current U.S. export and import policies regarding Cuba, investing in Cuban agricultural production and creating a viable and long-term trade relationship between the two countries. The three-day conference endeavored to increase sales of U.S. agricultural commodities and boost cooperation. The Council has been involved with Cuba many times over the years, sending a delegation to the island nation as recently as 2015 to examine the market potential for the U.S. grain trade and the financing possibilities the U.S. could offer the country. The recent mission continued this outreach focused on ag trade. Taking a page from U.S. companies already successfully doing business in Cuba, including Marriott and Jet Blue, meeting attendees pooled their knowledge and know-how to better understand the political and commercial situation to find ways to facilitate U.S trade to Cuba. Comprised of Cuban agribusiness leaders and farmer cooperatives and members of the U.S. ag sector – including corn, soybean, wheat, rice, poultry and potato industries – the mission participants had high hopes to begin to hash out the barriers between the two countries. “There are no easy answers in Cuba,” said Catalina Correa, U.S. Grains Council regional marketing specialist, Western Hemisphere, who attended the conference, “yet the soil is prepared for greater discussion in how to make the way to higher economic development despite the political realities of both countries. According to the U.S.-Cuba Trade and Economic Council, the United States has sold $5.7 billion in food and feed to Cuba since 2000, when an amendment to the trade embargo allowed agricultural sales for cash. U.S. farmers and agribusinesses would like to expand the market, but because the Cuban government is not allowed to make purchases on credit, there are still barriers to getting food and feed grains to the country of 11.4 million people. Despite this hurdle, the market is expected to offer significant opportunities for U.S. farmers with marketing year 2018/2019 import estimates of a million metric ton (39.3 million bushels) of corn annually, mainly from Argentina. If U.S. farmers could capture that market share, Cuba would be the 12th largest importer of U.S. corn and would also have the potential to increase its usage of U.S. distiller’s dried grains with solubles (DDGS) and other grains. It’s not just the credit issue that’s causing issues in Cuba, and it’s not just sales that are the main driver of U.S. interest. The humanitarian consideration of malnutrition is a reality for the population of the island nation. There is an established need for animal ag industries including broilers, eggs and beef, and this trip offered the opportunity for discussion about these needs between U.S. and Cuban farmers. Maintaining a consistent dialogue with Cuba is an important part of the Council’s programs with the country’s ag sector. USGC President and CEO Tom Sleight also recently met with the new president of Cuba, Miguel Diaz-Canel, in New York City in conjunction with the U.S. General Assembly meeting. Click here for more information on USGC’s work with Cuba.